One advantage of a journey between Amsterdam and Berlin is that one has a choice between train and aeroplane. If you consider that these days a flight mainly consists of waiting you won't be surprised about the choice made by someone who finds waiting even worse than sitting through a complete episode of Idols -- if that name rings any bells to you. The journey will take some six hours, so we quickly buy a few rolls at a station shop named AH To Go. I put the victuals and a 20-euro bill on the counter. The cash girl seems to look somewhat suspicious and calls her colleague: "Sorry sir, but this bill is a counterfeit." Fortunately, I have a replacement at hand. So this problem has been remedied quickly -- but what I'm going to do with the contraband is quite a different proposition which I prefer to be silent about. We board a luxurious carriage of the Deutsche Bundesbahn. Soon the notion of luxury turns out to be relative: some of our fellow-passengers seem to have been waiting until this moment to answer nature's call. We are only a few yards removed from the train loo and the olfactory sensations we undergo are not exactly those of roses. A few days ago I yielded to the seduction of an inexpensive Commodoor translation computer. Now I have plenty of time time to give this gadget a closer look. Its vocabulary could raise a few eyebrows: words that might be interesting to tourists like tip (for the waiter), post office, or even sanitary towels are completely absent, whereas people who might go looking for diverse words like anvil, pall , castration or debauch are accommodated. I wonder what kind of target group Commodoor had in mind when producing this gadget. After our arrival at Bahnhof Zoo, my sweetheart and I only have to cover the distance to hotel Kassandra. We discover that the custom to assign even numbers to one side of the strreet and odd numbers to the opposite is not an international matter of course. We pass the Kurf�rstendamm , which experts claim was built after Parisian model -- which enables us to taste a bit of the Paris atmosphere without being exposed to all forms of swindle and third-rate eating houses by which Paris distinguished itself during our last visit. The German dinner we enjoyed around seven o'clock may have been less refined than the French cuisine is reputed to be (but which we never had the chance to savour in the French capital), but it was tasty as well as nourishing. That weather predictions can be a tricky affair becomes clear when our breakfast is accompanied by the sound of rain descending on the streets of Berlin. Our breakfast confirms the notion about German food formed yesterday: not very refined, but nourishing and tasty. The kitchen appears to be run by two ladies who are not only good at serving breakfast but would also be excellent testers of sitting furniture. You may be wondering why. Well, quite simple: each of them has an estimated waist girth of about seven feet. After breakfast we venture into the busy bustle of Berlin. We get into the N�rnbergerstra�e, where we soon find the Kaufhaus Des Westens in our path. A plan of the store tells us they have an electronic toys department (no, madam, no vibrators), and since my sweetheart is more interested in clothing than I am, we decide to split for an hour -- a decision I'll regret when I discover the electronic toys department is being refurbished. But it gives me ample time to roam rather aimlessly about a store that has a lot to offer to those of us who like to show off -- as may for instance be gathered from a gilded pc keyboard which will make those that covet it so much that they actually purchase it 3000 Euros poorer. 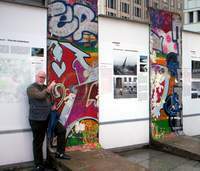 Since we are making the tour of Berlin's well-known sites, we might as well see a few other famous Berlin spots, for instance the Potzdamer Platz, which is reputed once to have been quite a nice square but has now been turned into a playground for architects with bloated egos. 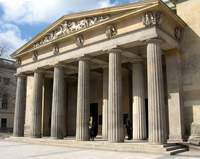 We continue our way towards the Brandenburger Tor, which has for the greater part become inaccessible because a film crew occupy most of the available space. We have ample opportunity to see all kinds of well-known sites. On our way back we pass the Bauhaus Museum, so that we have not only walked a distance close to twenty kilometres, but have also beheld quite a bit of famous architecture. In Germany, the Gro�e Duden is nearly as well-known as The Oxford Dictionary in Britain. But what is special about the Dudenstra�e is that it contains a shop named Elektroschach, which houses a large collection of chess computers. The walk to the Dudenstra�e takes us through residential areas which we would otherwise never have set eyes on. After a walk of about one hour and a half, Heide Ketterling's shop has been reached. Inside there is only darkness -- no living soul to be seen. We take our refuge at a bakery on a nearby street corner. In case Mrs Ketterling returns from her lunch break, we hope to be able to see her from here right away. Almost every passer-by makes us believe it's Heide going to open the shop which so far is shrouded in darkness. But in vain: nobody stops and the end of our trip remains disappointingly dark. Finally, we decide to venture a last effort: if the Ketterlings live close to their shop, we may try to ring their doorbell. We do indeed find a bell marked "Elektroschach Ketterling". But even ringing three times does not invoke any response. We are about to return when we see somebody in the shop. I knock on the window to indicate that we would like to visit the shop. My sweetheart suggests the shop door may just be open -- which happens to be the case. After entering we are informed by Heide Ketterling (for it was she whom we saw) that the door had been open all the time. Inside, I see chess computers of all the great manufacturers: Mephisto, Saitek, Excalibur, Millennium and Novag. Unfortunately, there are no second-hand machines at the moment. I don't want to leave the shop empty-handed, so I buy a Novag Carnelian. While the chess computer is being tested, packed and the papers filled in, I have the opportunity to exchange a few words with Heide. She knows quite a lot about chess computers and if there were a championshop of female experts on chess computers, I'm sure she would win gold. After leaving the shop we see a large sign with a text that we both find very strange. What is this firm supposed to do? Does it stage accidents? The next destination in today's journey is the Jewish Museum, which is situated at a distance of about two miles from Elektroschach. After some three quarters of an hour we spot the museum with its characteristic architecture. After entering the museum we have to pass through security gates and our luggage is x-rayed (or whatever these machines with conveyor belts are used for). The first part of the museum is devoted to the holocaust: various personal documents and other possessions are displayed, which give a general impression of the former owner, along with a short biography. All these stories invariably end with "murdered in Auszwitsch" (or another camp the nazis used to carry out their nice little plans). Slightly depressed, the Amsterdam company returns to hotel Kassandra. Their mood improves when they enjoy a good meal at an Armenian restaurant, where shortly after their entry a large company arrives. One of them actually looks like young Kasparov. We try to guess whether they are Armenians or Lebanese. The waiter helps us out: the party turns out to be ... jewish. We decide on taking bus 100, which will take us along the route we walked on Tuesday. Shortly after we have descended from the bus, Lea's preference for big men becomes clear again. My sweetheart and I are intrigued by the name Unter Den Linden , an avenue in the former East Berlin. The location is quickly found, but it looks a lot less romantic than the name might suggest: large excavators and bulldozers block our view of the trees after which the avenue has been named. As we walk on, we find ourselves in the midst of nothing but huge palaces, temples and whatever awe-inspiring buildings one can think of. 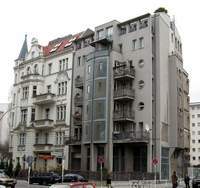 Since neither of us care much for impressive architecture, we hurry along and take a look in the former East Berlin. There we also see quite a lot of refurbishment in progress. Perhaps we should return here in a year or eight -- if we are given enough time to live. Bus 100 appears to have a stop around here, but passengers can only get off. Fortunately, we discover a stop with more options at the opposite side. So for the next three quarters of an hour we'll have another look at all the sights we have seen seen before, but this time in reverse order. We finally descend at Bahnhof Zoo. In the evening we accept an offer made by Hotel Imperial, where a "romantic dinner with candle light" is presented, but we miss the advertized candle light. But as far as visual elements are concerned, what we did see (and taste) was a mash of green peas -- a German speciality that neither of us ever tasted. Neither of us deems it necessary to add it to our list of favorite dishes. If you are interested in technology, you cannot really visit Berlin without going to the Trebbiner Stra�e. 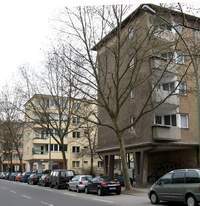 The trip to this street does not exactly lead through Berlin's wealthiest areas. The last part of the journey contains more viaducts than I have ever seen in such a short distance. I haven't really counted, but I wouldn't be surprised if there were more than twenty in one mile of road. But at last, there is the Deutsche Technikmuseum . Unfortunately we have no more than two hours left. We came to Berlin by train, so needless to say we want to see the wonderful collection of railway carriages and locomotives. There is an exhibition about GDR railway diners, where Lea demonstrates that she likes a cuppa. We also see the Enigma, the device the Germans used in the Second World War to encrypt and decrypt secret messages. But inexorably, the moment comes when we have to return. At a quarter to five our train departs from Bahnhof Zoo. On the train, both of us are very happy that we've brought our mp3 players and can enjoy the blessings of technology: otherwise we would never have been able to read with a company of six rowdy students having seats close to ours. A few minutes to eleven we arrive at Amsterdam Central Station.